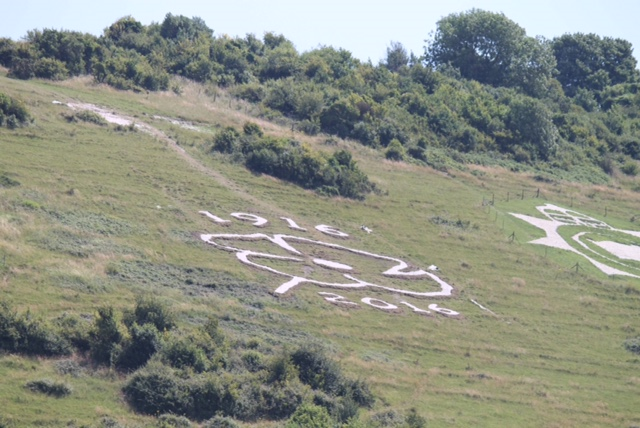 On the morning of Monday 4th July 2016 the team assembled at East Farm in Fovant. As well as an outline of the project from Kris Strutt of Southampton University, we were given a safety briefing by members of the Royal Ordinance Corps. When digging trenches on Fovant Down, we have all to be aware that live ammunition was used during the training of soldiers in the WW1 camps. 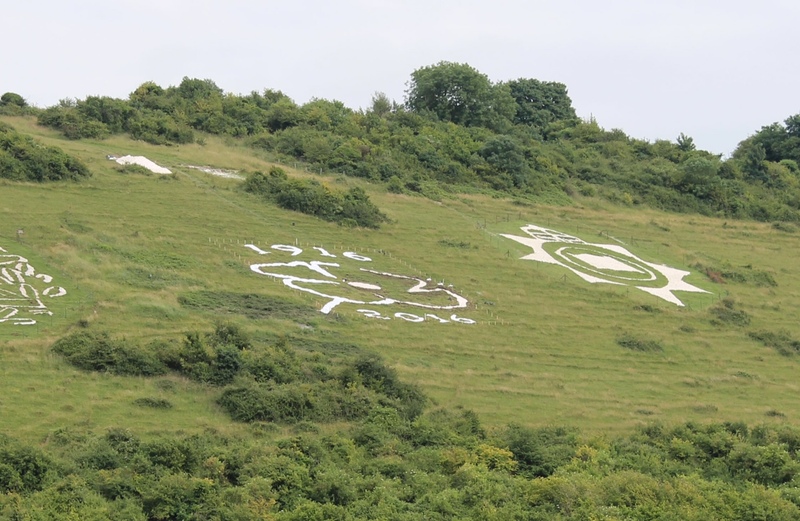 There could be some remains of such ordinance on the hillside (although it is more likely to be found under the fields below the downs). So the build of the new Centenary Badge began on 5th July. 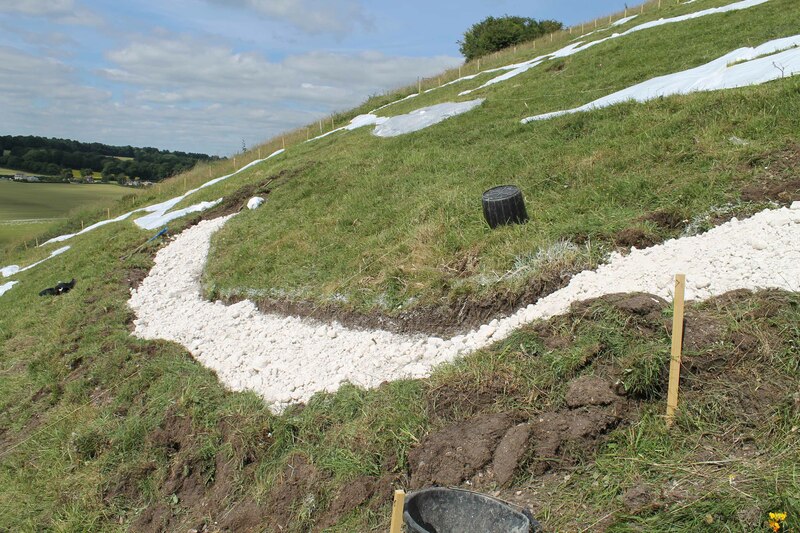 The first trench was dug and filled with chalk. Take a look at these photos (the white areas in the background are plastic sheeting used to “map out” the badge area). On 6th July we started to carry out some “geophys” on the cricket field near East Farm. This field was used by the Fovant cricket team (now disbanded) and is just to the west of the farmhouse at East Farm. Staff and students from Southampton University made up the majority of the teams. The work involved marking out the field into 30 metre squares using tapes and lines, and then walking over the ground with the instruments to collect the data. We should get some results soon. The next day was focussed on digging out the trenches on the new badge, with further work on geophys in the cricket field. To dig we used mattocks and spades, as the object of the project is to work on the badge in the same way that the soldiers in WW1 did. So no mechanical aids! 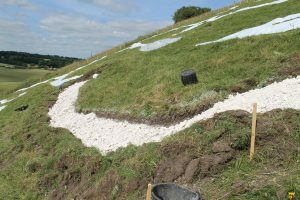 The trenches for most of the design are about 1 metre wide, and they were dug to a depth of 20 cm – that should be deep enough to hold the chalk. Good progress was made. On July 7th we had a manpower boost – four soldiers from the Royal Corps of Signals joined us! They were tasked with cutting out the centre of the poppy, and they also managed to fully chalk the centre. That was a really good bit of work and we are very grateful for their superb efforts. At the end of the first week about half of the main badge design had been dug, and some chalking had been carried out. Thankfully the weather was fine during the week, so we made good progress. Over the weekend we did more digging in preparation for the following week. The second week has seen great progress. We have had many volunteers – Alix, Sarah, Jenny, Alison, Henry, Hector, Michelle, Louisa and Georgie (sorry if we’ve missed anybody! ), and a group from Team Rubicon UK. Thanks once again to all the hard-working staff and students from Southampton University, who have worked tirelessly on the badge and have carried out fieldwork on nearby fields. The badge has now been dug (apart from a small section on the top petal to allow the chalk bags to be dragged through!) and all the trenches have been filled with chalk. Now all that remains is to bulk up the chalk to ensure the badge looks even better from the A3o. The new badge at the end of week two. Amazing! So, by the end of the third week we had completed the new badge! We would like to thank all the volunteers who gave their time and effort into building the badge. Without your help it would have taken many weeks (months?) to complete the job. Here is a photo of the completed badge. 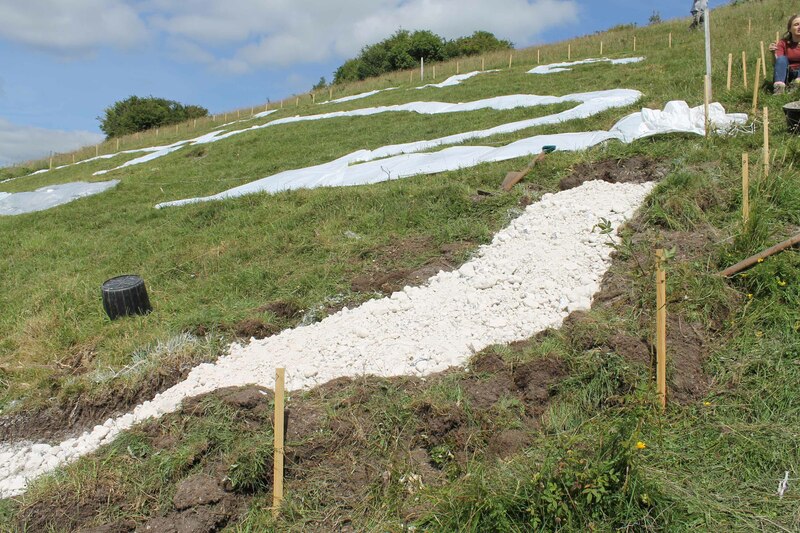 On the 20th and 21st July the final tidy up was done, removing all the plastic sheeting and posts that were used to mark out the badge before work started, and moving the remaining chalk (thanks Les!) behind the bushes so that it wouldn’t be visible from the A30. Believe it worth the sacrifice. These badges emblemise their lives.